Discussion in 'Amps and Cabs' started by smolder, Jun 17, 2008. 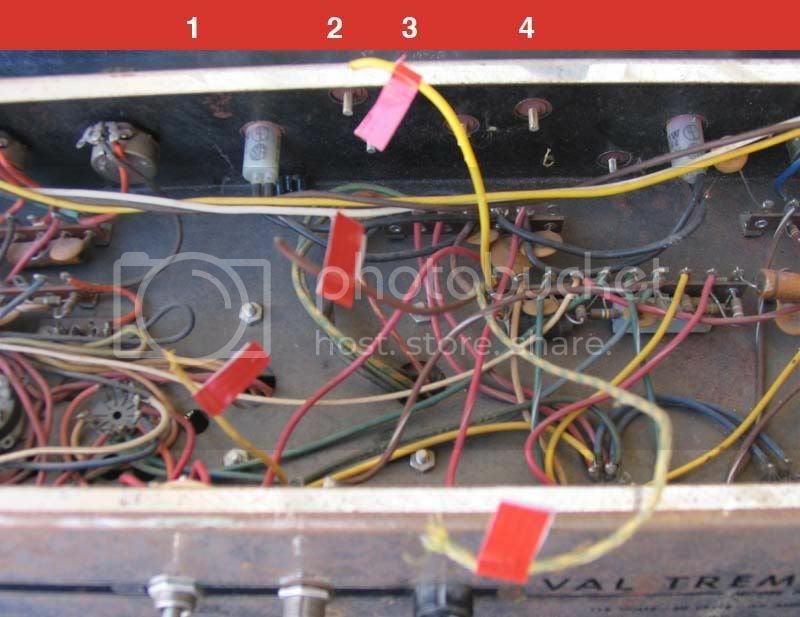 I have an old National Vale-Trem circa 1960-62 from catalog identification that I literally rescued from a barn. It is in rough shape... but the 2 C10 speakers sound wonderful and I would like to restore it. Most all of the electronics are there but I have four detached wires on the underside. Looking for schematics (so far, my search has turned up empty), wiring diagram, or pictures of circuit boards. Any help would be greatly appreciated. 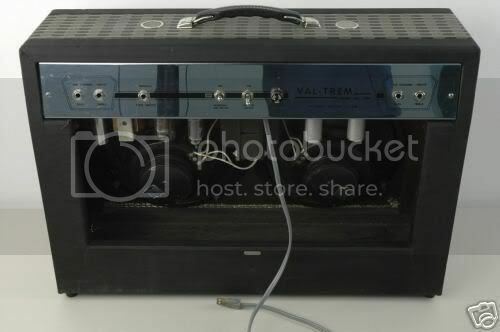 Probably never be worth much, but could sound cool. 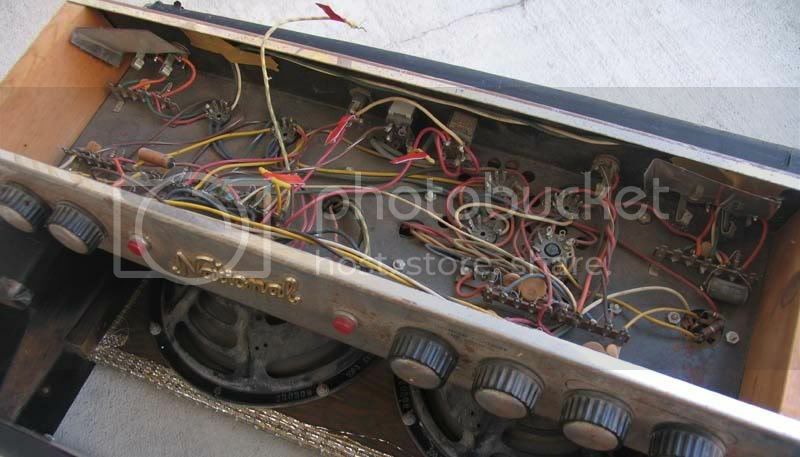 Update: Here are photos of the wiring on the amp. Wire one is a gold weave and come off the standby switch. Wire 2 is brown plastic and comes off the top wiring post. Wire 3 is yellow plastic and wire 4 is green and gold weave - both 3 and 4 come off the middle row, middle wiring post. There are solder blobs on two of the other contacts of the standby switch. Any help would be greatly appreciated! Got any pictures the amp itself? Might be able to reverse engineer where the wires go. I haven't seen a schematic for that particular model, but maybe someone has one somewhere. Doh! Excellent idea... I will shoot the bugger this evening and post the results. Unfortunately I can't be of much help restoring it. Thanks Rumble - I checked with Terry bit he had neither the schematic or a diagram. I know a good tech could fix it, but this could become a real money pit, and I would kinda like to do it myself if at all possible. thanks Allen... that would be a huge help.